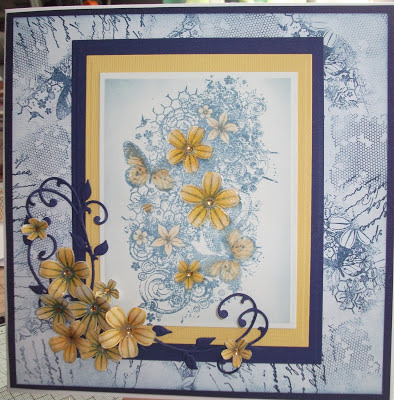 I wanted to use my latest Indigoblu stamp for this challenge, Summer Lovin is such a lovely detailed stamp, I just wanted to highlight the main flowers and the butterflies, but there are also, humming birds, bees and scrolls in there. Again I was inspired by Jo Rice's card using the same stamp. The title of this challenge is Backgrounds Galore, I used my favourite Itsybitsy background stamp with Cobalt blue Archival ink, I added script stamp and using the Summer Lovin stamp without a block I stamped selected areas, mainly the flowers, butterflies and scrolls. The topper was stamped using Stormy Sky distress ink and then I coloured the main flowers with promarkers, then I use my perfect medium pen to cover the petals, added clear embossing powder and heated. I then stamped the image again twice coloured and glazed the main flowers and cut out to make embellishments together with some Marianne diecut swirls. My husband loved the colours I had used so I have 'killed two birds with one stone' as his sister has a birthday in July ...problem solved.